← Where will Calgarians be buying holiday homes? Bidding wars have eased, but are still commonplace. 26% of homes sold for list price or higher in June. The average amount paid over list price was $6,417. 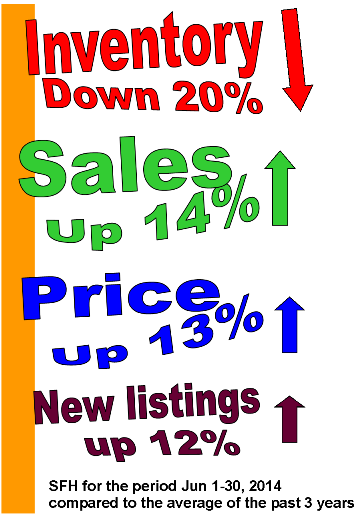 The trend is your friend: The sales-to-new-listings trend is decreasing. Last year it was increasing. If you bought an average home in Calgary in June 2013, the price has increased $40,000 in the past year. This entry was posted in Bidding wars, Calgary SFH, Market update, Month-end. Bookmark the permalink.